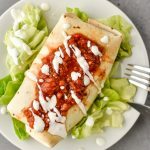 Perfectly portioned lunches cooked 100% in your Instant Pot are completely possible! 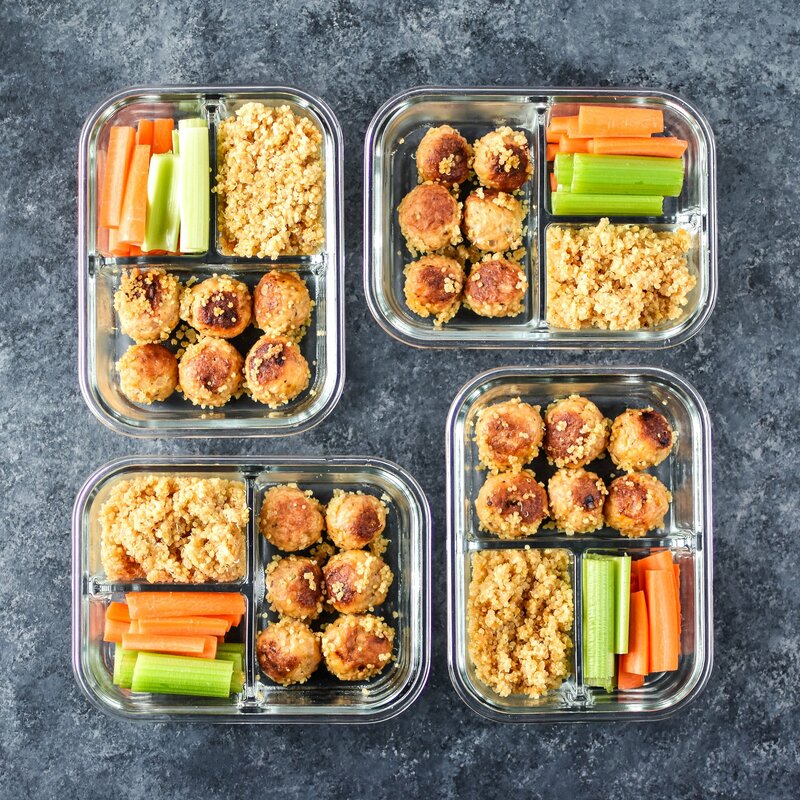 Pressure cook easy buffalo chicken meatballs and fluffy quinoa TOGETHER in this Instant Pot Buffalo Chicken Meatballs Meal Prep (+ oven directions too)! The sauté function is life changing. It works very well and I’m not sure I would be as into the IP without it. My stove doesn’t get dirty (because I’m not using it when I use the IP). Less dishes = happier me. 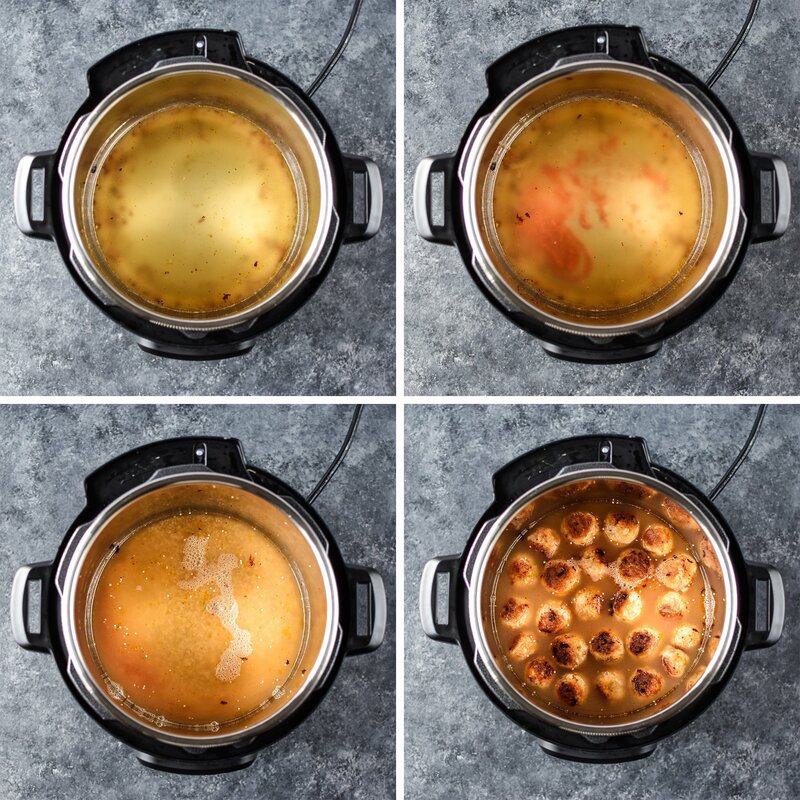 Cooking foods together has never been easier (see this entire post for an example). It’s *usually quicker than alternative methods. 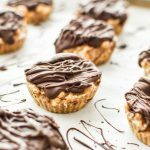 I’ve noticed some recipes like to casually leave out the time it takes to build up pressure, which can be quite a chunk of time. Still easier and totally hands-off. Everyday experiments. Put something in and see what happens! I’ve mostly been doing this with vegetables to see how long things take to cook. Full disclosure: I’m still getting to know my Instant Pot. The Instant Pot was a Christmas gift from my mom. Pressure cooking is totally new to me. If you follow along on my Instagram story, you might see that I’ve been using it basically every day since I got it so I can learn as much as possible. I’ve been through the manual several times. This is a serious relationship. So since I’m not so much into sharing a new life story for every recipe post, this time I thought I’d instead give you a nice narration of my Instant Pot learning journey (I actually can’t guarantee this won’t turn into a life story🤷‍♀️). The one thing I do feel fully confident making in the IP is quinoa. 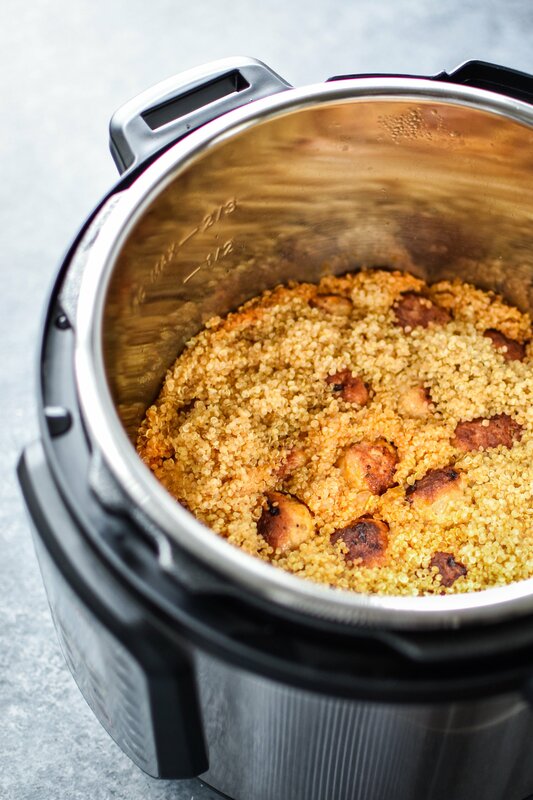 I tested and practiced several times when writing about How to Cook Quinoa in the Instant Pot. This is now my preferred method since it takes about half the time of the rice cooker and is completely hands-off. And, because cooking quinoa on the stove is just something I do not like doing. Why? I don’t know. But I think once you try more hands off methods too, you’ll agree. My first time cooking these meatballs in the Instant Pot worked pretty well, except for the fact that I literally drenched them in buffalo sauce because I used it as the “liquid” in the IP. AMATEUR MOVE. After reading tons of recipes (lots WITHOUT 2 full cups of liquid), scrolling through intense discussions about the topic (Facebook Instant Pot groups are both informative and terrifying) and having an adult science revelation, I realized I needed more actual liquid instead of just buffalo sauce 🔥🔥🔥 in order to properly cook the meatballs. Fast forward to a few days later. After some serious thought, I decided that the meatballs and quinoa were… wait for it… Going in the IP together! I realized it would be okay to add the buffalo sauce after cooking. Better yet, let individual eaters add their own preferred amount of buffalo sauce. So I made it happen. Brown the meatballs first. Then, the water needed to cook the quinoa would also fully cook the meatballs, making this a ONE-POT MEAL. Sold. Done. Count me in. The bottom of the IP insert isn’t perfectly flat, so the oil tends to fall to the edges. Because of this, I noticed browning the meatballs works best if you put them around the edges of the insert. That being said, 12 meatballs perfectly fit around the edge of my 6-quart IP, meaning you can easily brown these meatballs in two batches using the Sauté function. Mix, form & brown meatballs using sauté. Add broth & hot sauce to empty IP. Add rinsed quinoa to IP. Natural pressure release 5 minutes, then quick release. (let it depressurize fully, then) FOOD. NOTE: Food going into your IP never looks as good as it does coming out. Another note: It can also look weird coming out. 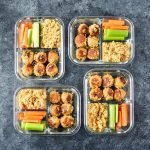 Get some meal prep containers — this is an affiliate link to the glass ones I have pictured! 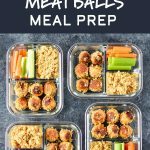 This meal prep makes 4 servings, which means 6 meatballs for each meal. Fish your meatballs out of the quinoa and add 6 to each container. 1 cup dry quinoa equals about 3 cups cooked, which means each container gets about 3/4 cup cooked quinoa. I like these containers because a perfect portion of quinoa fits into one of the small compartments. Grab 4 large carrots and 4 stalks of celery. Cut to fit into the small compartment and divide evenly between containers. Add any extra buffalo sauce on top of your quinoa and meatballs. Remove the raw veggies before reheating. I set them on my paper towel while the dish is in the microwave, then put them back into the container when it’s out of the microwave. 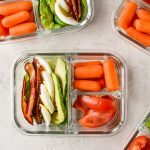 Perfectly portioned lunches cooked 100% in your Instant Pot are completely possible! 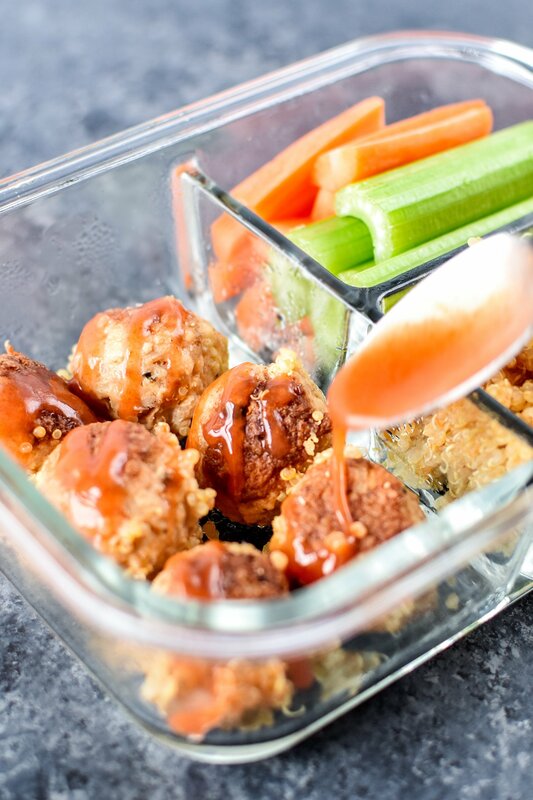 Pressure cook perfect buffalo chicken meatballs and fluffy quinoa TOGETHER in this Instant Pot Buffalo Chicken Meatballs Meal Prep! In a large bowl, combine all the meatball ingredients except the oil. Mix with your hands until just combined. Refrigerate for 30 minutes (chop carrots and celery, then set up your meatball rolling station during this time!). 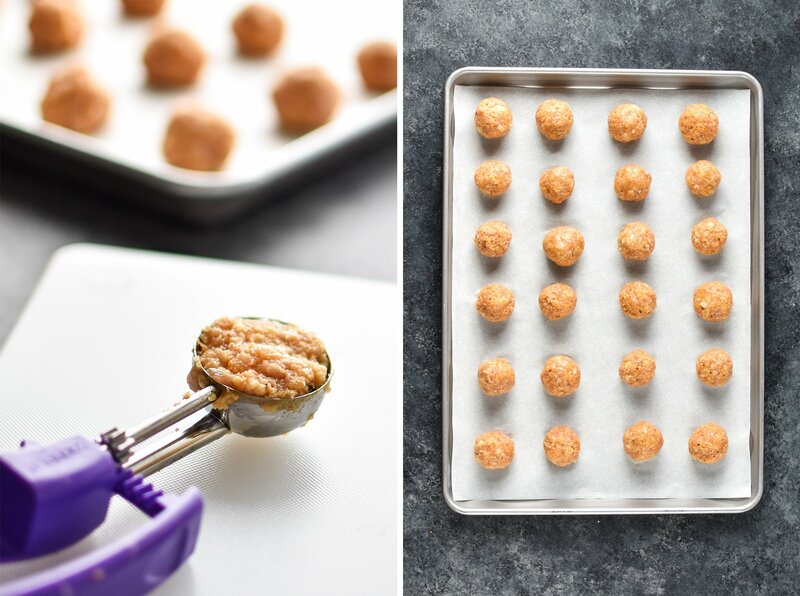 Line a baking tray with parchment paper to use as your meatball staging area. Using clean hands (and a #40 scooper if you have one), form the meatball mixture into 24 meatballs, approximately 1-inch in diameter each. Hit the Sauté button on your Instant Pot (affiliate link!). When the display says Hot, add oil to the insert. Use metal tongs to add 12 meatballs to the IP. Let them cook for 2-3 minutes or until browned on the bottom. Flip each meatball and let them brown on the other side for 2-3 minutes. Remove the meatballs and place them back on the baking tray (they will not be fully cooked yet). Repeat with the remaining 12 meatballs. When all the meatballs are browned, hit the Cancel button on the IP to turn off the heat and wait at least one minute before moving on. Add broth and 1 tablespoon buffalo sauce to the IP. Next, add rinsed quinoa. Use a spoon or jiggle the insert so all the quinoa settles evenly on the bottom (careful, it’s hot!!). Finally, add all 24 meatballs to the broth, on top of the quinoa. Place the IP lid on, and make sure the steam release valve is sealed. Set the IP to Manual or Pressure Cook for 5 minutes. When it’s done pressure cooking, let the steam naturally release for 5 minutes. The quinoa will continue to cook during this time. Hit the quick release. 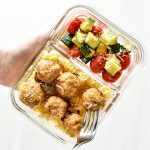 After the float valve has gone down, remove the lid, let it cool, and portion the meatballs and quinoa into meal prep containers (affiliate link for the glass ones pictured!). Add your veggies, as much buffalo sauce as you want, and you’re done! Keep sealed in the refrigerator for up to 4 days. Remove raw veggies when reheating! If you don’t have an Instant Pot: No worries – cook quinoa any way you like (in the rice cooker or on the stovetop according to package directions). Mix and form the meatballs, but cook them in a 400 degree F oven for 20-25 minutes, or until fully cooked through. Portion out your meal prep bowls in the same way, drizzle with sauce and you’re good to go! If you want to skip the quinoa, simply follow steps 1-3, then add 1 cup of chicken broth and 1 TB hot sauce along with the meatballs in the IP. Pressure cook for 5 minutes, followed by quick release. Please keep in mind that due to the nature of pressure cooking there may be inconsistencies from small variations in ingredients or altitude. Try it and see what works best for you! Nutrition information estimated with My Fitness Pal. 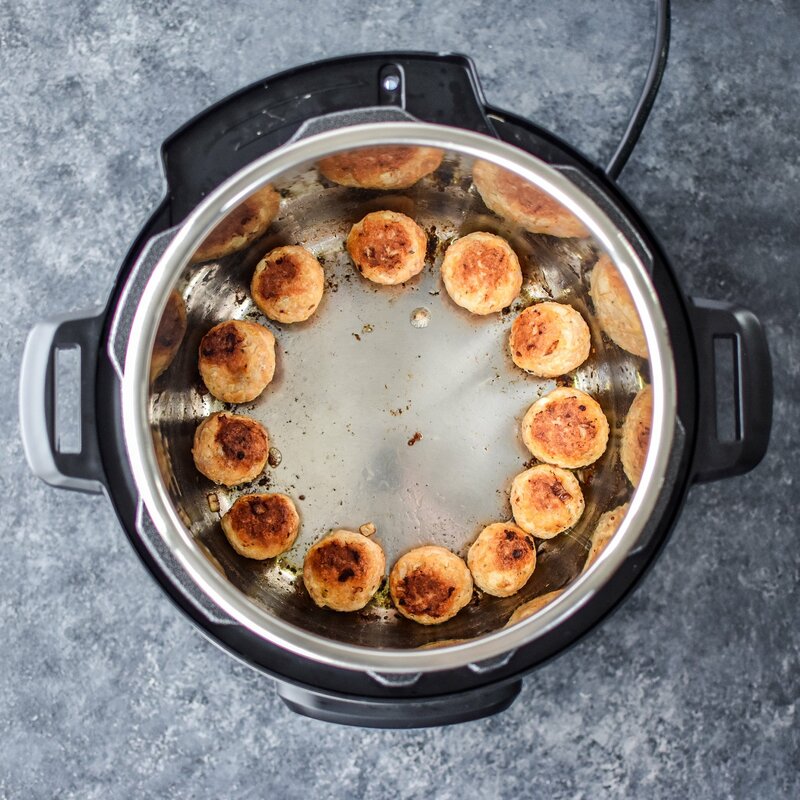 Recipe inspired by Instant Pot Korean Chicken Meatballs by The Bewitchin Kitchen. 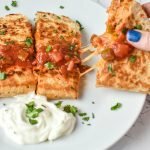 Thanks for checking out the Instant Pot Buffalo Chicken Meatballs Meal Prep! 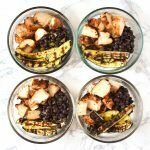 Let me know how this works for you – I’m still getting used to the Instant Pot myself. Tag me or use #projectmealplan on social media to share!